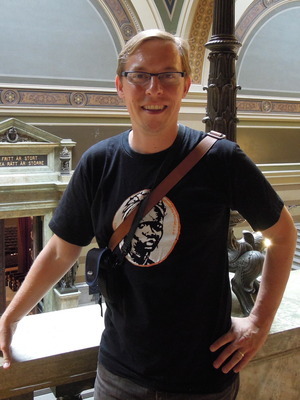 Ryan Skinner is a musical anthropologist who studies the expressive cultures and social worlds of contemporary Africa and its European diaspora, with extensive fieldwork conducted in Mali and Sweden. Specializing in the analytic methods of cultural anthropology and ethnomusicology, Skinner’s research focuses on issues of popular culture, ethics and aesthetics, public piety, cultural policy, intellectual property, racial identity and politics, and new social movements in the African world. Skinner’s scholarship has appeared in such journals as African and Black Diaspora, Africa Today, Research in African Literatures, Anthropological Quarterly, Africa, IASPM@Journal, Popular Music, and Mande Studies. He is the author of Bamako Sounds: The Afropolitan Ethics of Malian Music (University of Minnesota Press, 2015), an ethnographic study of the popular music, postcolonial history, and public culture of Bamako, Mali. Skinner serves as Director of Undergraduate Studies in the Department of African American and African Studies and directs the Lectures in Musicology in the School of Music. He holds affiliations with the Departments of French and Italian and Germanic Languages and Literatures.